Price-to-book can be a useful metric for finding undervalued stocks. The price-to-book, or P/B ratio, is calculated by dividing a company's stock price by its book value per share, which is defined as its total assets minus any liabilities. Low P/B ratios can be indicative of undervalued stocks, and can be useful when conducting a thorough analysis of a stock. In a nutshell, a lower price-to-book ratio could indicate that a stock is undervalued. When comparing two stocks with similar growth and profitability, P/B can be useful for determining which is the best value at that moment in time. This can be especially true if a stock's book value is less than one, meaning that it trades for less than the value of its assets. This can also be a sign of trouble in a company, so it should be used as part of a thorough stock analysis, but buying a company's stock for less than its book value can create a "margin of safety" for value investors. P/B ratios can also be useful if a company has inconsistent or negative earnings, since common metrics like price-to-earnings wouldn't be meaningful in these situations. For example, many bank stocks have extremely inconsistent earnings, so the P/B ratio can help get a clearer picture of the value of these companies. 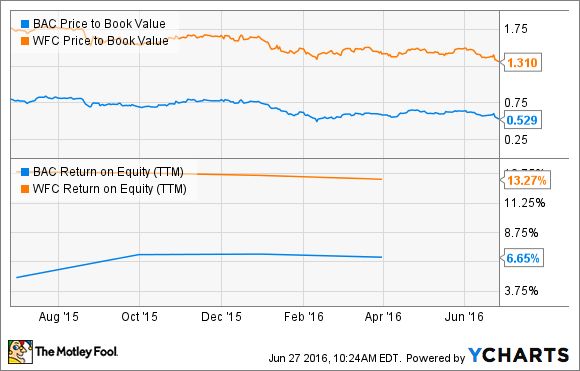 Book value is equal to a company's current market value divided by the "book value" of all of its shares. To determine a company's book value, you'll need to look at its balance sheet. Also known as shareholder's equity or stockholder's equity, this amount is equal to the company's assets minus its liabilities. Next, divide the book value by the number of outstanding shares, in order to find the company's book value on a per-share basis so we can compare it with the current share price. Finally, divide the company's current stock price by the book value per share. Let's say that Company X has a book value of $1 billion on its balance sheet, and also has 100 million outstanding shares. Dividing these two numbers gives us a book value of $10 per share. If the current share price is $15, this translates to a price-to-book multiple of 1.5. Price-to-book is only effective when evaluating certain types of businesses. Specifically, if much of a business' assets are intangible, as is the case with many technology companies, price-to-book isn't terribly meaningful. For example, Apple trades for nearly four times its book value, even though it is considered cheap by most analysts. On the other hand, price-to-book can be useful for capital-intensive businesses like banks. Also, it's important to mention that the P/B ratio doesn't tell us much all by itself. Rather, it's most useful in combination with profitability metrics such as return on equity (ROE) in order to get a bigger picture of a company's valuation. For example, Bank of America trades for a rock-bottom price-to-book multiple of just 0.53 as of this writing, while Wells Fargo trades for 1.31 times book. However, this information by itself doesn't necessarily mean that Bank of America is "cheaper." In fact, Wells Fargo's ROE is double that of Bank of America. The point is that while price-to-book can be a useful metric to have in your toolbox, it's only part of the puzzle when it comes to evaluating which stocks are undervalued.